As we don't currently have a place for this, I figure we can host these threads in the General Hang-Out for the time being. Some of us are beginners, some of us are experts. Some of us just dabble, and some of us are professionals. What we all have in common is that we're musicians. Our goal is to make music. So, tell us about yourself and let's hear you! Flute was my first instrument, but I'm primarily a guitar player. 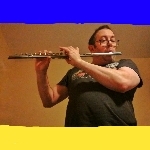 I'm nowhere near a great flute player, but I can play what I need to play to make the music I want to make. I am a Celtic Folk musician and the front man for a Hawaii based Celtic folk/rock band. Like Phineas, I play a lot of different instruments. Here's one of my solo vids, where I played all of the instruments. I used my Casey Burns folk flute on this one. Really?? Everyone has a flute, but nobody is playing it? How long have you been playing with those guys? Did you enjoy your recent cruise? Hehe... Pretty much all of my life! The cruise is in 2019. That's one of three weeks I'm likely doing with the band in the pacific northwest next year. Have you got any music to share?!? I'd love to hear what folks are playing! You can upload a sound clip to http://instaud.io and post up the link! That was wonderful, and sounds super fun to play! I didn't realize you played guitar as well. Very nice! I must hear the story of how you ended up moderating a flute forum! I have pretty extensive experience with audio production. If you need some help, let me know. I can also point you at a series of articles I started writing for a guitar website on recording for the complete newbie, and I can give you all of the lectures from what is probably the best and most accessible course on audio production I've ever seen. I would love to see your articles on audio production, are they on a website? It would be cool to maybe do a little housekeeping and move posts to the appropriate boards to keep things more orderly. I sent you a PM with links to my articles, as well a link to the lectures from the audio production course that I recommend to absolutely everyone interested in recording. I play weekly, but I rarely record myself except to hear how I sound when I'm practicing. I don't post my practice stuff on YouTube. This is really cool!! I remember seeing something about a flute virtual choir, but it seemed a bit intimidating. You have so much experience and expertise, you should record a bit more to share with us! Well i complemented your playing and the post got removed for being off topic!